Place me in a room with a high pitched beeping sound occuring at 30-second intervals. This will lead me to the point where I will want to either lash out and hit someone or scream. (Definitely not typical Kara behavior.) How do I know this you ask? Well, do let me share. As most of you know, Dave went to his tryouts for the Ultimate Frisbee Team USA this past weekend. (He says he did well, by the way. Thanks so much to everyone who prayed for him and sent your encouragement our way. We'll know if he made it sometime within the next couple weeks.) So, since Dave was gone, I was all by myself with our pups. Not a big deal. Usually. On Saturday night, everything had been going splendidly, and I tucked myself into bed at about midnight. Maggie and Rogan were curled up on the bed next to me, and I drifted off quickly. Then, at approximately 1:30am, I was woken by an incredibly loud and high-pitched "BEEP!" 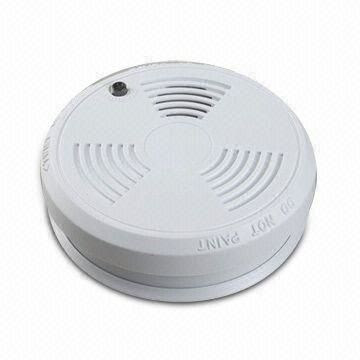 I knew right away that it was our smoke alarm...we'd been getting occasional warning beeps like that lately, letting us know that the battery would need replaced soon. There would usually just be one or two beeps and then the smoke alarm would chill out and give us another couple of days before its next warning. Assuming this was the case, I ignored the first two beeps, then settled back to sleep. Only to be jolted awake by another beep 30 seconds after the second. Then another 30 seconds later. Then another. Then another. I sat up, clueless as to what to do. Let me guess what you're thinking. "Why didn't you just change the battery, Kara??" Let me tell you why. Because the smoke alarm was placed on the wall near the top of our 14-foot vaulted ceiling. That's why. Fourteen feet in the air (or something like that). I am 5'5". Our tallest ladder is a 3.5-ft step ladder. Those numbers just really don't add up to 14'. Even with the length of my arms in there...just not even close. So I sat there staring into the darkness, the tension inside me building with each additional beep. In the midst of my grogginess and exhaustion, I had a hard time considering my options. My first thought was that I would sleep on the couch downstairs. But sleeping on the couch sounded absolutely horrible (how would the dogs cuddle with me?? ), and besides that, I was willing to bet I would be able to hear the beeping down there too, since the living room is right below our bedroom. Then I thought I could sleep in the spare bedroom. Which I quickly remembered had no sheets on the bed (I was in the process of washing everything) and no alarm clock to wake me up in the morning for church. I grumbled and realized I was going to have to take everything with me. I pulled the top sheet and blankets off the bed, piled my alarm clock, pillow, and phone in my hands, and started stumbling down the hall to the spare bedroom, dreading the thought of sleeping on a mattress cover instead of sheets in a bed much less comfortable than ours. I think I was having an even more negative attitude simply because my husband was gone. It was lonely enough sleeping in bed without him, and now I was being forced to go sleep in my old bed on just a mattress cover. I was just overflowing with negativity. Then...just as I reached the door to the spare bedroom...the beeping stopped. I breathed a sigh of relief. I turned around and marched happily back to the master bedroom. I threw the sheet and blankets back on the bed, plugged in the alarm clock and reset the time, climbed in, curled up, and fell back asleep. Until 2:30. When the beeping started again. This time I was even more angry. What was I supposed to do?? I found myself praying hard to God..."Please God, why are You doing this to me?? Why are You letting this happen?? I just want to sleep!!" (Yes, in the middle of the night, such a scenario does seem trajic enough for such pleas. I was beyond exhuasted. Cut me some slack, here.) Since the beeping had stopped after a while the last time, I was sure it would stop again. So I decided I would wait it out. I pulled the covers over my head. Not good enough. I tried sticking my fingers in my ears. Not good enough. I tried a different angle of sticking my fingers in my ears. Still not good enough. I tried stuffing kleenex in my ears. No help. I got up and dumped out a container of random bathroom items all over our bathroom counter, hoping to find some earplugs I once had. No luck. I ripped a cotton pad (for makeup removal) in half and tried stuffing it in my ears. It didn't stay. I briefly considered using tape to hold it in my ear, but decided against it thinking that might not be the most comfortable option. And the beeping wasn't stopping. I finally realized that the smoke alarm had made up its mind. It was not going to stop. Angrily, I grabbed up all my belongings again and marched down the hall. I slapped everything down in the spare bedroom, then had to search all over for an outlet to plug my alarm clock into. I fumbled with it, trying to once again set its time. All the while I could hear the beeping echoing down the hall. The neverending beeping. We finally settled in the bed, and I tried to relax. Only to discover that I could still hear the beeping. Every 30 seconds. Through two closed doors and down the hall. Loud enough that I could not fall asleep. I was at a loss. Then I remembered our air purifier. White noise, that's what I needed. I got up once more, marched down the hall (now nearly fully awake), unplugged the air purifier in our room, and towed it back to the spare bedroom. I dropped it with a loud thud in the bedroom, then began another search for an open electric outlet. I finally found one, turned the air purifier on, and climbed in bed. Ahhh...peace. Almost. I could still hear the beeping through everything, but it was now quiet enough to let me sleep. Thank goodness. Soo....I finally got to sleep and stayed asleep until my alarm went off in the morning. When I got up, the beeping was still going, at even more frequent intervals. I knew I was going to have to find a way to make it stop. There was no way I could go another minute with that sound echoing through the house. So I did what any insane-driven husbandless woman would do. I found a way to get myself 14 feet in the air. The solution was to push our standup chest of drawers right under the smoke alarm, then add the stool to my vanity stand on top. When I climbed up on both items and stretched my arms, I could just reach the smoke alarm. Perfect. I wish I'd had a picture of me up there. I bet I looked so talented. Changing the battery with such poise and ease. I was so thankful we had already purchased replacement batteries. I would have been REALLY grumpy if I'd also had to go to the store. Thankfully, I made the battery swap and climbed down in one piece. The beeping was gone. Relief poured over me. I could finally breathe. So that is my torture story. I cannot even explain the anxiety and anger that built up in me with every continuing beep of that smoke alarm. Of course it got me thinking, what I am going to do down the road when I have a baby screaming in the middle of the night? I'm hoping that the love and attachment I will feel toward that baby will overcome my intense feelings of anger and anxiety. Either that or Dave will be having a lot of sleepless nights (hehe). (Totally joking.) After everything, it took me about 30 minutes to clean up all the messes created by that stupid smoke alarm. I had to take the stool down and put it away, push the chest of drawers (very heavy) back into its place, put the 3.5 ft step ladder away (I at first tried to use it instead of the stool, but it wouldn't fit on top of the chest of drawers), move my bedding back into the master bedroom, once again unplug, replug, and reset the alarm clock, put away all the items I'd dumped all over the bathroom counter, pick up the little pieces of tissue and cotton pads (my attempt at makeshift ear plugs), and move the air purifier back to its place. Sigh.